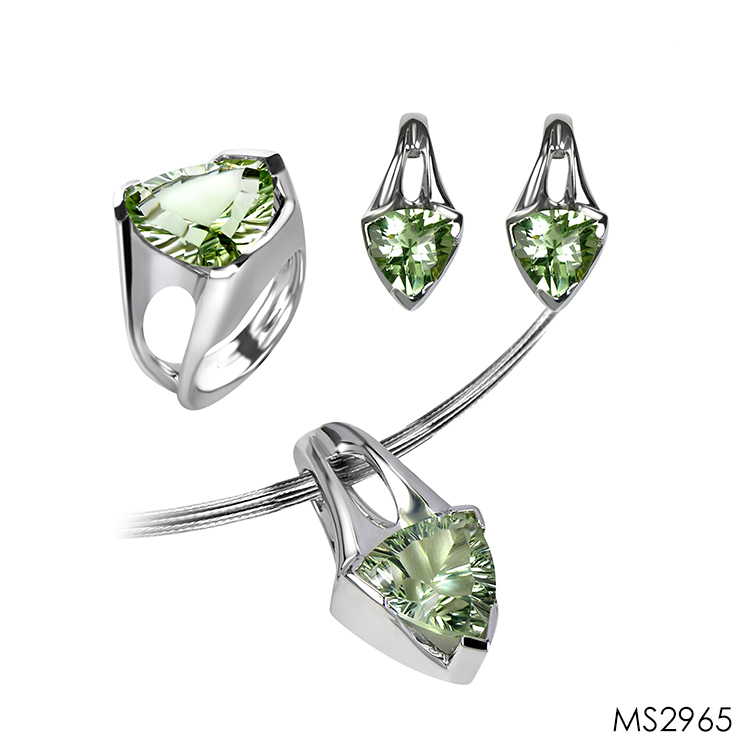 This Sterling Silver suite features a Green Amethyst set, including a Pendant, Ring and Earrings. The pendant (MSP2965/GAM) includes a 14mm Trillion Cut Green Amethyst. The earrings (MSE2965/GAM) include a 10mm Trillion Cut Green Amethyst in each earring. The ring (MSR2965/GAM) includes a 14mm Trillion Cut Green Amethyst. The set tray image also shows the rings in additional colors, Black Rutilated Quartz (BRQ) and Caribbean Blue Topaz (GBT), a Frank Reubel Designs Signature Stone.